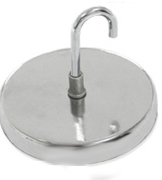 This versatile magnetic is assembled with an attached hook and can has a 20 to 40 lbs pull. Use to hang lights, tools, keys or signs from metal doors, tool boxes, filing cabinets or any ferrous metal surface. The 2" features a powerful ceramic magnet and the 1.40" features a neodymium magnet-both with a non-scratch liner.